Swim Smooth are excited to announce six UK Clinics in Loughborough, Coventry, Bolton, Stirling and Hillingdon in May. Each one day clinic features full video analysis and is strictly limited to 12 swimmers - perfect for any swimmer or triathlete looking to improve their speed and efficiency in the water. Swim Smooth are also announcing our third and fourth Coach Education Courses in the UK following the extremely successful events last year. These three day courses will run at Loughborough University from 5-7th May and Stirling University from 14-16th May. The Coach Education Course is an intense program for ambitious swimming and triathlon coaches of any experience or level and will teach all of Swim Smooth's coaching methods including advanced stroke correction. 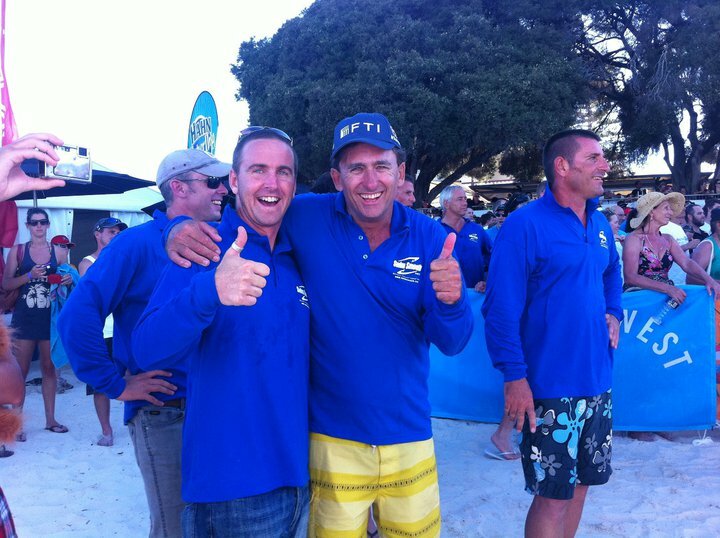 The three day course will be delivered to twelve selected coaches by Swim Smooth's Paul Newsome and Adam Young. These courses are endorsed by Triathlon England and Triathlon Scotland as recommended CPD for triathlon coaches looking to take their swim coaching skills to the next level. The BTF have requested Swim Smooth's expertise to develop their swimming coaching resources and deliver coach training and this course is a key component of that role. Paul Newsome and I very much look forward to working with you in person in May. It's simple: Pick the article that suits your site best, apply to use it and we'll approve your usage by email. You agree not to modify the article and we retain the copyright. Deal? It's very easy to recreate the article on your website, we'll send you all the code and images you need, you or your web designer will be able to get the feature live in minutes. We haven't heard of anyone doing this before but we thought it was a neat idea! We know how hard it can be to find interesting content for your website visitors. From our side it helps us reach as many swimmers as possible so we can help them improve their swimming. PS. If we haven't written the perfect article for you yet, write to feedback@swimsmooth.com and tell us what you'd like to know or what you need help with. The more specific your question the better. 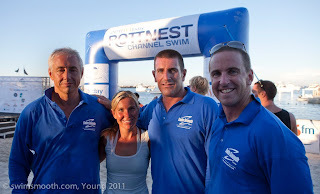 The Rottnest Channel Swim is an iconic 19.7km open water race in Perth, Western Australia - Swim Smooth's coaching homebase. It's our favourite event anywhere in the world and every year we train a large group of solo and team swimmers for this fantastic race. 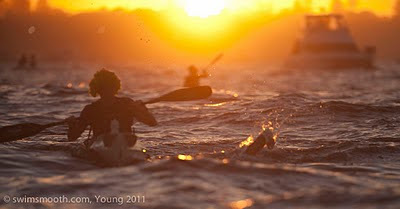 If you plan a trip over to Australia and feel like a real challenge, why not aim to do the race yourself in 2012? Last Saturday was the 21st edition of the event and we thought you might enjoy some of our team pictures from this great race and enjoy reading Paul Newsome's race report from his solo crossing and his thoughts on racing in open water. Warning - it's a bit of a monster post so grab a brew and enjoy the read! Click on the pictures to see them larger. Congratulations to all of you who successfully completed the 21st Rottnest Channel Swim on Saturday! We had 29 soloists complete the race and another 64 swimmers in duos and teams - a record for the Swim Smooth Squad. You can see our team results here. 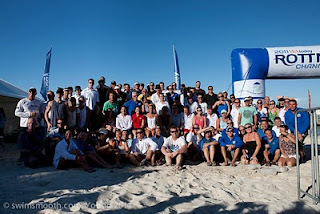 As usual it was an awesome event and this year we had seemingly perfect conditions - the recent heatwave giving us warm flat water and only a light north easterly wind. The expectation in the build up was extraordinarily high with many of you expecting some very fast times. As you'll see from the results, we had real depth this year within the squad with ten solo swimmers from the squad finishing together in highly commendable times between 6h20 and 7h00 which is just fantastic. It is the shared goal and camaraderie that was inspired during all the hard training sessions that made this squad so successful this year, so hats off to you guys! 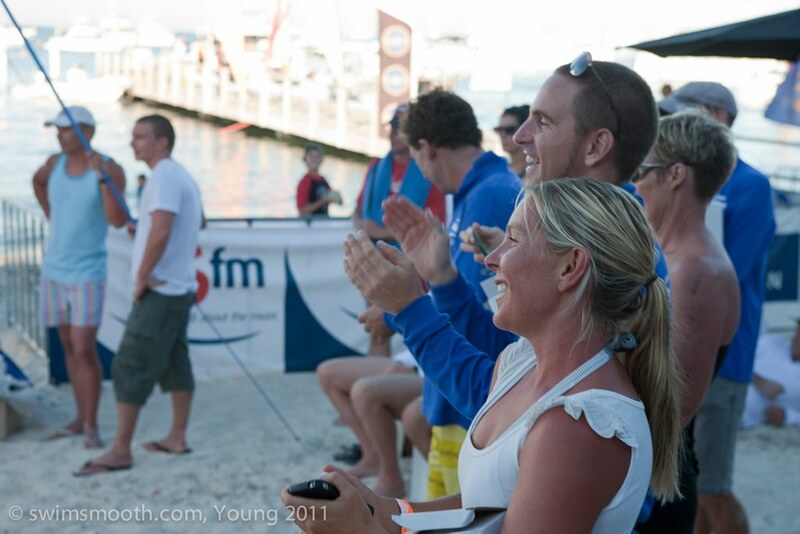 The stand-out performance this year for me has to be that of Paul Downie who first attempted the swim back in 2009 when we first ran our Solo squad with just 13 swimmers in total. That year Paul went through a very rough patch and suffered with very sore shoulders with about 4km to go to record and eventual time of 9h16. This year he absolutely smashed it and recorded 6h51 - nearly 2.5 hours quicker! Truly brilliant. 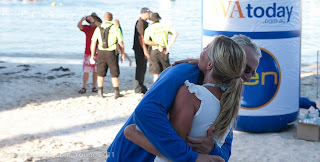 This will give Paul great confidence going into our English Channel Swim attempts in six months time. Also smashing his PB with a very well deserved time of 6h37 was Wayne Morris who strung together the perfect race finishing superbly with a massive sprint to the finish - nice job! Sadly, Susanjane Morrison was pulled from the water with just a few kilometres to go after having inhaled quite a bit of seawater. We wish her a speedy recovery and hope that she can bounce back next year in a similar manner to Paul Downie from two years ago. Well done to all our Solo swimmers who took part in the event - your commitment and hard work over the course of the program has been truly inspirational to me and I thank you for the great times we've shared together...it's going to seem like a quiet few weeks ahead! I know from talking to you at the pub afterwards that many of you were disappointed with your times. Me too. Looking back now the conditions were far less favourable than they seemed with the race winners finishing at least 30 minutes slower than they are capable of swimming. The reason for this seems to be the northerly current that materialised on the day and although not super-strong it was present throughout the race, not just when we got close to Rottnest as it normally is. I thought I'd take this opportunity to share with you a few thoughts of my own about this year's race. You know me, I love my numbers and this objective feedback as you just can't hide from the reality of what they tell you - good or bad. The key is in learning how and where you can be better next time. A quick bit of history: prior to Saturday's swim I have done three Rottnest Duo crossings and my first Solo swim in 2009 just 6 days before we had our first child, Jackson. In 2009 I was really hoping to get close to breaking 5h00 and trained very diligently for it, averaging around 40km per week in training. 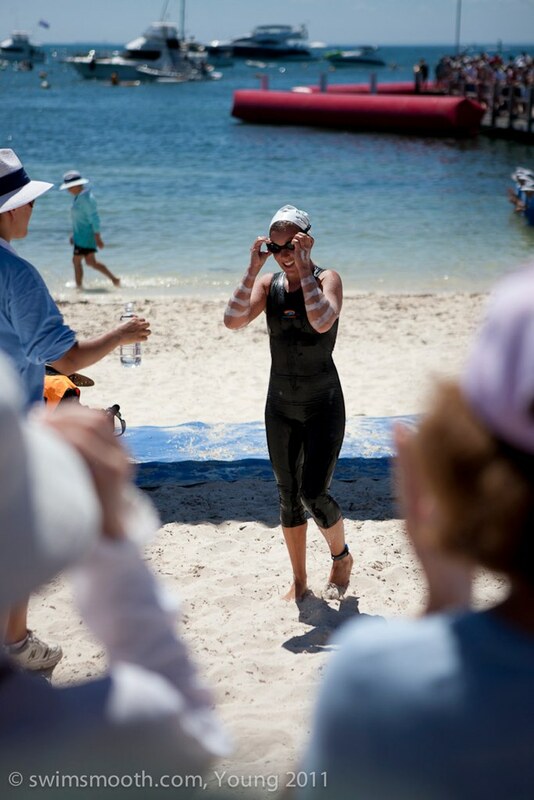 That year I felt I executed my best possible race and got my nutrition spot on. However, I exited the water in 5h24 and was immediately dissatisfied with my result based purely on my time. In retrospect though, conditions that year saw a strong North to South current in the last few kilometres really slowing progress with the winner only doing 4h40. Like this year it looked set to be a great day for fast times as well but sadly this proved not to be the case and most people left feeling a little deflated. 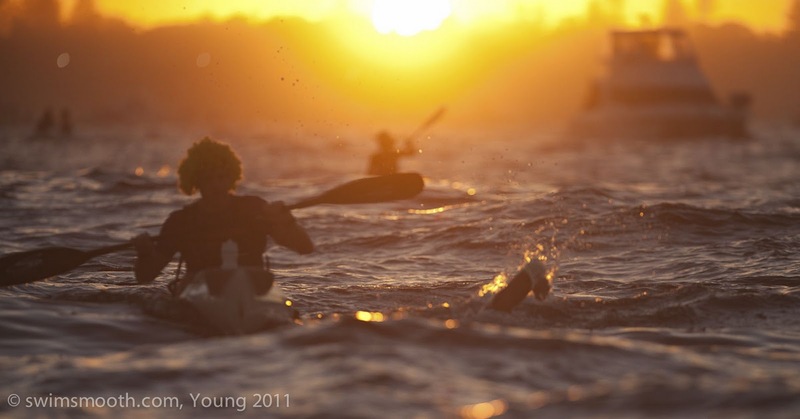 That's what open water swimming is about though, it's a sport totally open to the elements and good planning and strategy is critical to a successful swim. The significant drop off of 90 seconds per km after 50 minutes is very interesting, especially as it happens so quickly and at a time when I was just starting to find my groove too. Could it have been an early current? Who knows. The crew started to feedback to me where I was in the field and who I was chasing at around the 3 hour mark, so maybe this spurred me into action at that point. So, why show you all this? 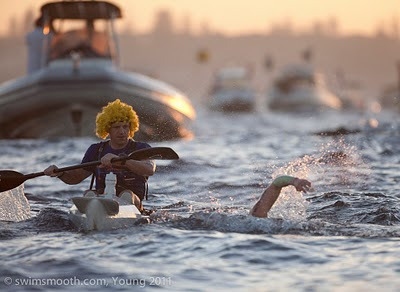 Well, I think it's always interesting to know exactly how far you've swum in open water. My paddler was wearing the GPS watch and correcting for the 400m I swam at the start without him and a little more for the finishing shoot, we believe we did a total of 20.6km. 900m longer than the point to point distance of 19.7km, which sounds way off course but I think the general plot on the map indicates this is not the case. I spoke to many swimmers yesterday who claimed to have swum over 25km due to being pushed south by the current! The speed curve is interesting. 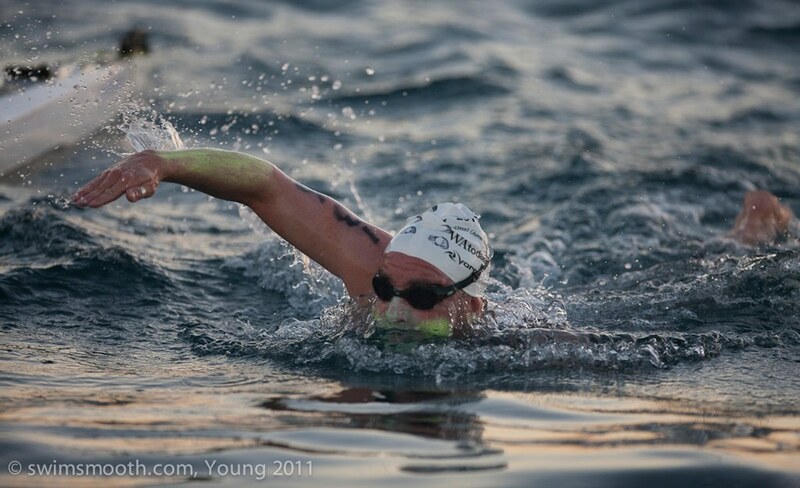 I am definitely swimming the fastest I ever have going into this event, having recorded some significant recent PBs over 1500m (18'28"), 5km (65'15") and 10km (2'19") in the last three weeks and was confident I could swim at about 14 minutes per km which would see me averaging around 14'30" per km with feed stops - good enough to break 5 hours for the crossing. If anything was lacking from my training it was a bit of mileage, I had only been able to consistently swimming 22-24km per week due to work and family commitments, with my peak week being 30km. My 10km result a few weeks back suggested I was well on target with things though. 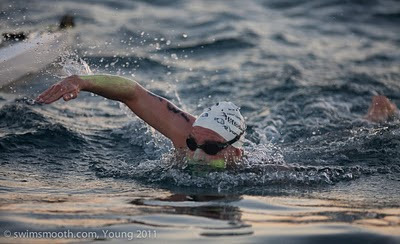 However, as soon as I hit the water I just felt flat and wasn't able to find a good rhythm until about 7km into the swim. This may, or may not, have helped me as normally I set off too quick and tend to blow up. After the 7km mark I felt like I was getting stronger and stronger and as reported by my crew was making up good ground and passing a good number of swimmers after my relatively poor start to the race. The crew started to feedback to me where I was in the field and who I was chasing at around the 3 hour mark. I was hammering in the last 90 minutes of the swim and made up five places in that time but was only swimming at 17 minutes per km. I think it's a safe bet to say that the current at this point was particularly strong for those of you a little demoralised by your times. Was I happy this year? Physically I don't feel like I had my best swim this year but mentally I felt like I was able to really tough it out which will be very important for when I attempt the English Channel on the 5th September (twice the distance). I've always felt this has been a weak side to my preparation and racing in the past so it's a good feeling to think that this is maybe getting better as I'm getting older. At the end of the day I didn't get close to the 5 hour marker but placings-wise I did finish exactly where I thought I should and I did manage a 65 second P.B. in the process, so it's not all bad. I'm sure many of you might be feeling the same way about your swim if you were off pace with where you expected to be this year. I'd encourage you to go through and spend 15 minutes or so simply jotting down where you could improve for next time. This will be really useful. Looking at my notes after my 2009 race my goal was to see if we could improve my navigation as I felt everything else that year was pretty much spot on for a first attempt. Whilst I don't have the records to prove this was the case though (no GPS in 2009 to compare against), I do feel this was achieved and without my crew's awesome support on the day I'm sure I'd still be out there swimming to India! Thanks guys, you were great! 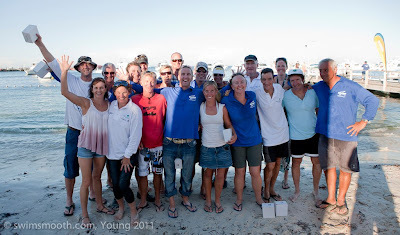 OK crew, have some nice recovery time after the race and see you all over the next couple of weeks at the pool and on the beach. 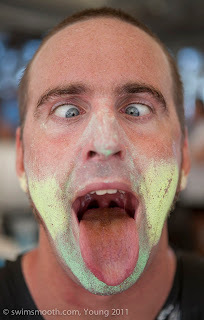 P.S anyone got any tricks to overcome that horrible salty / swollen tongue problem?